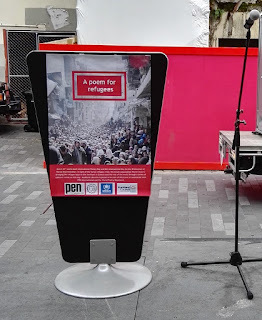 As World Poetry Day rolled around this week I was taken aback to read on the website of its founder, the United Nations Educational, Scientific and Cultural Organisation, UNESCO for short, that one of its aims is to ensure that "the art of poetry will no longer be considered an outdated form of art". What? Someone thinks poetry is like hair jewellery? Who are these people talking to? "Encourage a return to the oral tradition of poetry recitals" on the other hand, is an aim I am happy to get behind. Although "poetry recital" does sound -- if not quite outdated, perhaps overly quaint, evoking the poetry pursuits of school-days (of which, please note, my memories are all good) - I am a huge believer in poetry being shared not just through books but by being spoken, performed, read aloud, and slammed.